The latest edition of Engineering Mechanics–Dynamics continues to provide the same high quality material seen in previous editions. It provides extensively rewritten, updated prose for content clarity, superb new problems in new application areas, outstanding instruction on drawing free body diagrams, and new electronic supplements to assist learning and instruction. Part 1 Dynamics of Particles. Chapter 1: Introduction to Dynamics. 1.1 History and Modern Applications. 1.7 Solving Problems in Dynamics. Chapter 2: Kinematics of Particles. 2.5 Normal and Tangential Coordinates (n–t). 2.8 Relative Motion (Translating Axes). 2.9 Constrained Motion of Connected Particles. Chapter 3: Kinetics of Particles. Section A: Force, Mass, and Acceleration. 3.3 Equation of Motion and Solution of Problems. Section B: Work and Energy. 3.6 Work and Kinetic Energy. Section C: Impulse and Momentum. 3.9 Linear Impulse and Linear Momentum. 3.10 Angular Impulse and Angular Momentum. Chapter 4: Kinetics of Systems of Particles. 4.2 Generalized Newton′s Second Law. 4.5 Conservation of Energy and Momentum. Part 2 Dynamics of Rigid Bodies. Chapter 5: Plane Kinematics of Rigid Bodies. 5.5 Instantaneous Center of Zero Velocity. 5.7 Motion Relative to Rotating Axes. Chapter 6: Plane Kinetics of Rigid Bodies. 6.2 General Equations of Motion. 6.7 Acceleration from Work–Energy; Virtual Work. 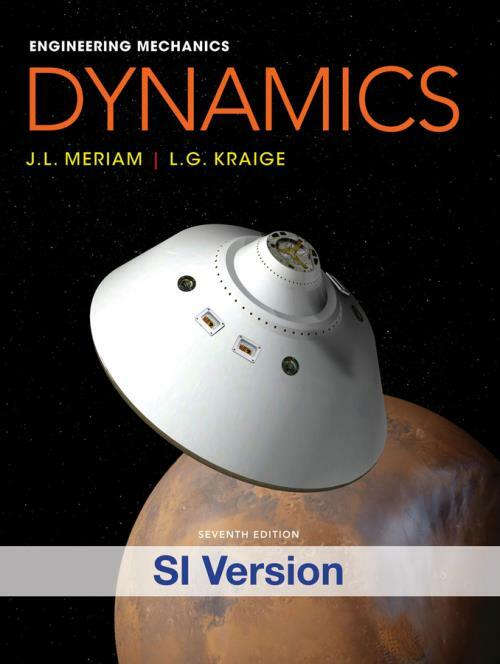 Chapter 7: Introduction to Three–Dimensional Dynamics of Rigid Bodies. 7.5 Rotation about a Fixed Point. 7.9 Momentum and Energy Equations of Motion. 7.11 Gyroscopic Motion: Steady Precession. Chapter 8: Vibration and Time Response. 8.2 Free Vibration of Particles. 8.3 Forced Vibration of Particles. 8.4 Vibration of Rigid Bodies. Appendix A: Area Moments of Inertia. Appendix B: Mass Moments of Inertia. B.1 Mass Moments of Inertia about an Axis. Appendix C: Selected Topics of Mathematics. C.11 Newton′s Method for Solving Intractable Equations. C.12 Selected Techniques for Numerical Integration. Table D.2 Solar System Constants. Table D.3 Properties of Plane Figures. Table D.4 Properties of Homogeneous Solids.